ONEADAYRECORDS – Simply Delivering Quality Music to the World in Quality, Safe Packing. Postage: UK £4.75 (£1 per extra record). Europe (including Russia) £12.50 (£2 per extra record). Rest of World (including ALL parts of the USA) £16.50 (£3 per extra record). All boxes signed for in quality, safe packaging – I NEVER use mailing envelopes that offer virtually no protection at all – in fact I think these things should be banned as records WILL arrive damaged in them at some time. Here, you get what you pay for – SAFE PACKING in BOXES using 7mm DOUBLE-WALL STIFFENERS. Full details nearer the end of the listing. Posting to Russia: Yes, I do post to Russia. But delivery can take up to 4 to 6 weeks from the UK. So please be patient. I will submit a tracking number to the winning bidder, and when the packet arrives there it can be followed online using the Russian post website. ALSO: I now apply the Ebay ‘2-day’ rule for non-payment to keep things moving – cash-flow is important for any small business. I will always keep my P&P prices as low as possible, and even after yet another Royal Mail price hike from April this year, I have NOT raised my prices and will never compromise on solid, safe packing that is invariably heavier than most you will get. My P&P offers probably the best value-for-money for vinyl records available, and I even will pay for full insurance on any record that sells for over £100 at NO extra cost – that is UK and abroad. Also I aim to post the very same day after payment is received. You WILL see the difference when my packet arrives. FINALLY: Late payers will now be blocked at my discretion. As will any bidder who cancels a bid. I do not like this practice as it is most often used to phish out the price to beat. Ebay does not approve and neither do I – so only bid on my items if you want them. 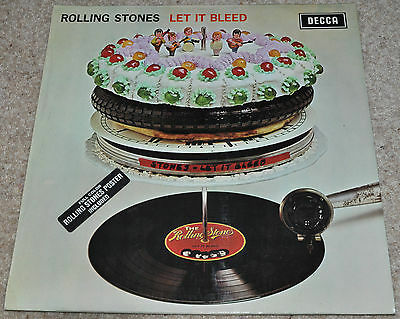 Artist or Band: THE ROLLING STONES Album Title: Let it Bleed Producer: Jimmy Miller. Chief Engineer: Glyn Johns. Assistant Engineers: Bruce Botnick, Jerry Hansen and George Chiantzalias. Cake: Made by former TV cook Delia Smith. Cat Number: LK 5025 TRACK LIST: Side 1: Gimme Shelter, Love in Vain; Country Honk; Live With Me; Let it Bleed. Side 2: Midnight Rambler; You Got the Silver; Monkey Man; You Can’t Always Get What You Want. Label/Format: Decca – original unboxed mono format with matt, smooth surfaces. Label Conditions: Both very clean, fresh and highly attractive. Spindle marks are very few and light in number and are very fine, only showing under angled light. This evergreen classic album is rarely seen quite like this, hardly played and offering close to perfect sound. Mode / Speed: Mono / 33.3 rpm. Warps: Assume all records I offer have no warping of any significance and all tracking is easy and effortless and should play on all turntables and even ‘budget’ decks. Weight of this Record: 135 grams. An average weight for this one. Country of Manufacture: England. Rarity / Overview: Regarded by many collectors as the cornerstone of any Rolling Stones collection, this legendary title in mono is highly prized and elusive, especially so ones that have been played this lightly. This was the last new Rolling Stones album to be issued in mono and also the last to feature Brian Jones before his tragic and untimely death. As the 1960s drew to a close, the mono format was largely in decline and the majority of new titles within this year were not even issued or made in the single channel mode. Most people who still wanted mono records purchased them very quickly on issue and far fewer were available in the shops, many had to be specially ordered from the smaller retailers. Those who did buy the mono version usually did so to play on mono equipment (obviously) which so often meant wear and damage from heavyweight, thick, and often worn mono stylus that were far more prone to inflict groovewear and serious marks. Those that surface often with large marks, deep scratches and a multitude of spindle marks and rarely will such copies play with enjoyable sound, especially on modern critically revealing equipment (for which they are not really designed for). This is a near exceptional example, it does have a small mark on ‘Love in Vain’ that emits four ultra gentle ticks, but that is about it – three of which are almost ear-to-speaker faint. By anyone’s standards for a 44+-year-old, very popular mono record, this is exceptional. Finding an original that will play totally ‘silent’ throughout will prove near impossible, especially played on such revealing stereo equipment. But it offers all that warmth, grace and depth of sound only the original record can offer. Few will not be delighted with this record unless ‘as new’ can be found – and at what price? The cover is clean and impressive as is the inner sleeve and poster. All have small blemishes, but for most realistic collectors acceptable and very minor indeed – all described in full further down. But in terms of looks and sound, this is one of the very best I have had to offer for some time and it will take some beating. Original Year of Release: 1969 Matrix Nos: XARL-9363.P-1A / XARL-9364.P-2A Stamper Codes: 1 K / 1 BA [for a popular record like this, these are very early first mothers and early stampers] Brief Artist & Album Info: One of the most in-demand mono albums ever issued, it proved to be the last by the band in this format and arguably the last of the true classics to be issued as such. Always a real pleasure offering a complete early-pressed mono copy of one of the greatest albums ever made by one of the world’s major acts - a truly essential album for any serious vinyl collector. By the end of the greatest decade in popular music, the stereo mode had largely replaced the ageing mono format that was now in sharp decline and very few brand new albums were made on it. The delivery of the sound is different and few could fail to be captivated by this very special album. The last Rolling Stones album to feature the presence of the band’s creator, Brian Jones. It was a brilliant culmination of all their musical influences throughout music’s greatest decade. The power of the opening track, ‘Gimme Shelter’, will haunt many forever with the memory of the Altamont murder, Jagger’s top hat and scarf and the death of the 1960s. The repeated line, ‘It’s just a shot away’, complements the repetition of the naively profound lyric of the album’s last track: ‘You can’t always get what you want’. The filling in-between, like the layered cake on the cover, is equally delectable. This a really impressive all-round copy, each element has the odd minor blemish, but put this into context – these 1960s albums in mono especially, are almost now vinyl antiques. Finding a pristine example is becoming near impossible. Any minor blemishes on this copy are far outweighed by all the major positives and all but the perfectionists will enjoy owning this monumental album. Cover Condition and Details: EXCELLENT(+): and this hardly does this lovely old cover justice. A single format, the front is laminated with Clarifoil and has the original sticker on front (which is almost as made, as can be seen in my close-up picture). With the peep-hole on back to identify a mono or stereo copy from the colour coded inner – mono being red, stereo blue (again see the close-up picture detail). Printed in England by the Upton Printing Group and has the UK Patents Applications No 43212/68 number. One of most famous covers ever – the cake made Delia Smith – and this does it excellent justice. Cover Lamination and Front: Firstly, can I make this clear, this cover is made from thin and delicate card making this sleeve very vulnerable to most forms of wear. This front looks fantastic and still ultra fresh with a superb shine and clarity, the famous cake will seldom be seen better. The laminate, as in most cases, has a little lifting on the spine edge but has no peeling. A regular trait of Clarifoil laminated covers that tend to shrink causing lifting or often severe bowing which this has largely avoided. The lifting on this one is quite mild and hardly even shows with normal full-on viewing, with just one tiny hairline crease on this area, this remains solid with virtually zero potential for any future issues. Not only that, this one has avoided any creasing of any note, but the real star feature is the immaculate shine and freshness. This Clarifoil laminate gleams almost as made with any dulling or friction rubs minuscule, even viewed critically under angled light. Incredibly smooth and scuff-free. Another integral part of this cover is the sticker which is simply immaculate, Mint as-made. So often removed by buyers at time of purchase, this is considered a crucial element to this cover. This is in superb condition and has not been picked at or ever removed or tampered with, that will be more than obvious from my close-up picture, it remains exactly as it did when purchased from new. This famous old cake will seldom be found a great deal better especially with an unboxed mono record inside - now over 44-years-old - incredible, but true. Graded on its own, I would put a Mint(–) grade on this beautiful front that almost sets the standard. Cover Back: Not laminated but still looking very attractive with any ageing or discolouration equally very light and mild. The peep-hole is immaculate and nice to see a RED inner filling it denoting a mono copy inside (please see this detail in close-up). Hardly any creasing at all, any present very light indeed and the lack of rubbing and ringwear is a huge bonus. The only small issue of note, thus my somewhat cautious overall grading, a small surface scuff near hte bottom edge just left of centre. In context a minor blemish, but a blemish nonetheless. This will still prove very difficult to find better. Top Edge: Totally smooth and unworn, typically thin and quite straight lacking the usual bowing many are seen with. Bottom Edge: Even better if anything and straighter still. Right Edge(s), and Type: Clean, very sharp indeed with barely any hint of wear at all, even as viewed end-on. Any hint of burring or thickening minuscule – this cover has been cover-protected for most of its existence. Record entered on this vulnerable wear prone side which is guaranteed untrimmed or enhanced in any way. Spine and Text: Still solid with just one tiny hairline and one tiny chip (being ultra critical), and mainly straight with minimal traces of compression. The ends are gently pinched in manufacture, this quite subtle. All text is perfect and unworn under the very solid and unpeeled laminate (and even this is shiny, fresh and untoned). This early cover has both mono and stereo numbers on it’s spine. Corners: All four corners are in fantastic condition with barely even a hint of any tip rubbing. Near Mint shape retained with no dinks and barely even a crease. Cover Summary: In terms of classic vintage covers, this is a lovely example, it will prove difficult to find much better with an original mono record inside. So many were very carelessly stored, roughly handled or simply used and abused. This one clearly far more sympathetically handled and stored with longevity in mind inside a protective cover. It’s paid-off, it looks impressive, not quite pristine with the small surface scuff on the back, but how many will not have the odd minor blemish at very best? Visually, this is really lovely, and given its thin card disposition, exceptional, it should please most collectors. The Inner Sleeve: EXCELLENT(+): and given its delicate construction, this is an impressive example. Made with very thin paper it is unlined and was way under-strength for practicality and longevity, but this has no damage and lacks the usual heavy creasing and crinkle – any traces here are minimal and very light with no hard creasing at all. It retains rich colour and minimal traces of ringwear from which this often suffers. This has NO black overprint on the ‘London Bach Choir’ text that was objected too and covered up later. The edges are all solidly intact, I cannot rule out a tiny split repair on one side edge as I can feel a hint of ‘hardening’. If so, this is very neat indeed and visually hardly registers, this NOT done by me. The top shaped recessed opening is crisp and clean as well, the lack of wear on this area is highly unusual and seldom seen. So overall a very impressive inner sleeve that again will prove very difficult to find better – most seen these days are in tatters, split and badly creased. This another integral element to this set, again I consider this exceptional. The Poster: EXCELLENT(+): this only marked down for one or two tiny pin-holes on the corners – this in real terms looks fantastic with little else to fault. Very fresh, ultra clean and attractive, printed on one side only and on the thinnest of paper, no wonder so few survive like this. It has just two manufactured folds, no splits or weakening on them and no creasing or ruffling, even the back is clean and untoned or aged. This is as fresh and clean as manufacture day and the matt surfaces probably have seldom, if ever been touched. But clearly it has been (I would suggest, very briefly, and carefully mounts (and dismounted)). It is the original flat matt version, printed on thin paper, later ones were a little thicker and had a surface sheen. It is much sort-after and very important to any collector for this album. The pin-holes really are tiny and barely detract at all, mere blemishes on what is still an outstanding poster that I feel is undergraded. Vinyl Condition/Visual Grading: EXCELLENT(++): an overall grading for a superb record. A very impressive visual copy that is very clean with excellent shine, no dulling and very solidly pressed. A copy with only very light usage on all the evidence with any surface marks minimal and faint. The one exception being a small, very slightly more visible mark on side two as mentioned that emits four ticks, all but one being ultra faint and hardly registering, this being the only tiny blemish on what is still an outstanding example. A record more often seen trashed, few available example will look or sound better – and again I remind what I play all my records on. Visually a wonderful record that should please many, if not most-all collectors. Album Played For Grading: Yes. [I play ALL records I offer before submitting to Ebay, also the record is played in its entirety unless clearly stated otherwise. I do NOT play snippets or joining grooves to check for sound quality and quietness – I play from the beginning to end via clinically revealing B&W speakers that include the legendary tweeter from their awesome Nautilus range that reveals every blemish or minuscule sound present on any record.] Sound Quality and Audio Grading: This rare record plays even above it’s high visual grading with barely anything to fault bare the tiny few brief ticks as mentioned already. It offers strong totally distortion-free sound with no pressing noises or tracking issues*. Sound quality remains hugely impressive with a wide dynamic range and very detailed sound and the mono mix presents the music differently to the more familiar stereo version. Any surface sounds are minuscule and I have rarely heard such a superb all-round example. Few available examples with better this, of that I am certain, and only small percentage of those sold will survive in such lovely condition. These often, even usually, subjected to heavy stylus abuse, badly scratched and totally worn out. This copy has avoided such traumas and even on revealing stereo equipment, offers sound of the highest quality to please most fans. In terms of this very popular album, this has received hardly any usage, it could indeed prove a major upgrade for many. Practically nothing spoilt my pleasure when play-grading this wonderful record, such clean examples are incredibly hard to find in mono, and that is not putting too finer point on the fact. Personally, I would never buy any copy of this, or any record, mono especially that has not been carefully play-graded (on a quality system as well), the risk is far too great. This copy will prove very difficult to find better and can be strongly recommended. One with less unwanted will prove near impossible to find, this was a total joy to listen too. End Piece: How many copies of this one will truly still even exist in ‘perfect’ conditions? Even high grading Excellent copies are hard to find and few surface that will be offered on the open market. I am a critical listener and I would never personally buy a mono copy of this album that has not been play-graded, this is a minimum mandatory service for any potential buyer of this hugely important record. Groovewear or damage cannot be seen, only heard – the hidden enemy – and I have heard really disappointing copies of this and other mono gems that have even been unmarked, but play with unwanted groove sounds and substantial loud noise. This record has no traces of any frequency clipping and no horrible pressing noises or crackle. This is almost as good as vintage vinyl gets. Many regard it as the ultimate Stones album and remains totally essential - in mono it’s the cornerstone of any serious collection – the cherry on the famous cake, but never underestimate the stereo original either. This mono copy was never really designed to be played on high-end stereo turntables but my LP12 made this sound truly captivating. A ruthlessly revealing deck that brings out all the wonderful details and all what’s good about vinyl (unfortunately the bad too, if present – but have no fears, there is nothing bad on this copy – if three of four gentle ticks cannot be tolerated, well selling any vinyl record will be near impossible). Clearly detailed sound takes you almost into the recording studio itself and this is the definitive copy to own. This no way undervalues the stereo version because both are essential, they just present the music in a different way. It’s a title that always features high in any all-time greats list whether compiled by critics or the record buying public. It’s classic stature and timeless brilliance is etched into these vintage mono grooves. Also of note: there has been no official mono copy of this issued on CD, and after all this time, it is probably unlikely to be. With the correct care, this beautiful record will last indefintely. Classic albums or covers hardly get bigger than this, even putting this up for sale is proving hard – I hope this gets the good home it really deserves . * As played-graded on a high-end Linn LP12 Sondek turntable with Ittok Mk II arm and Ortofon Quintet Blue moving coil cartridge tracking at 2.2 grams. Now one of the most established sellers on Ebay and still offering the finest and most accurately described and graded records I can find. I pride myself on offering a variety of genres to keep my site as interesting as possible. I will rarely offer any record that falls below a true Excellent grading, unless its of a certain rarity which will justify offering a lesser grade. I try, to the best of my ability to describe as accurately and as honesty as I can all items I offer for sale with all the relevant information I can think of to help any potential bidder and collector. You may notice I only submit records sparingly on Ebay as I Play-Grade every record I offer in their entirety – also on higher-end equipment – not just bits to guess a grade - visuals alone do not always tell a true or full story. I will mention any defects or flaws no matter how small that I notice to be fair as possible to any interested collector – I am very fussy and my buyers have the right to be too. Every record I offer, whether it be a common or rare item deserves the same respect as far as I am concerned and will be treated the same - just because an item is rare does not always mean it’s good. I get just as much pleasure offering a relatively common record in stunning near mint condition as the real rare items. All the pictures I use for your guidance are taken with a digital camera or scanned - they are NOT improved, cleaned-up or made better looking than they are with camera trickery or enhancing with digital programmes. Room light factors can make things vary sometimes, that is hard to control, especially in winter. If any picture I take looks more flattering than the actual item for any reason, I will clearly state the fact in the advert and vice-versa. I hope the item below is to your liking - any questions can be emailed and I will do my very best to answer you. I am enthusiastic, and have a fair degree of knowledge about many genres and I promise quality items - bid with confidence - excellence comes as standard and so does Near Mint regularly. Please assume all records I offer have NO jumps, sticks, warps or writing on covers or labels unless clearly stated to the contrary. Thanks for your interest and Good luck – MIKE. Equipment Used for Play-Grading: I now play-grade ALL the records I offer (unless clearly stated to the contrary) on the following equipment: Deck: Linn LP12/Hercules/Cirkus with Ittok Mk II arm and Ortofon Quintet Blue moving coil cartridge (tracks at 2.2 grams). Amps: Naim Supernait 2 with Project USB phono stage and Tellerium Black interconnects. Speakers: B&W 704 Floorstanding 3-way Monitors (bi-wired with Tellurium Black terminated cable). All records I offer on Ebay are cleaned on a professional VPI-17 vacuum machine before play-grading for the cleanest and best possible sound and will include a brand new lined inner and protective cover too. Pictures taken with a Nikon D5000 SLR Digital Camera. PACKING - THIS IS WHAT YOU GET. What You Get: To confirm to the strict Ebay rules on shipping, I must now send ALL my packets ‘Signed-For’ with NO exceptions. Both buyers and sellers want their packets to have a safer journey and this is not a bad thing. I now offer the fastest possible posting, often the very next day after payment is received or within two to three days maximum (unless on holiday). I only use FIRST-CLASS Mail. The record’s cover will be placed within a BRAND NEW soft protective sleeve and the actual record will be professionally cleaned on my new VPI-17 Pro vacuum system to give ultimate clean grooves and playing surfaces and the best possible looks and ultimate sound quality. You will NOT get tired, dull looking, dust infested records inside worn and foggy covers with tatty inners from this seller and that’s a promise and guarantee. All records are posted in professional boxes (NOT Mailers, these do not offer any real protection). The record(s) are REMOVED from their main cover to avoid edge splits and placed within a brand new polylined inner. The record’s original inner will be included if available. The boxes are then reinforced with at least TWO, ULTRA THICK stiffeners for maximum extra protection – these are FOUR TIMES thicker than commercial stiffeners and are custom-made for oneadayrecords. Really rare and expensive albums will even be Double Boxed if deemed necessary and possible. When larger boxes are used, the thick record and stiffener ‘sandwich’ is then thickly embedded into bubble-wrap to bulk out the record inside the box to centre the item inside to reduce the risk of damage still further. Printed address labels are used for clarity as well as a sender label. Customers requests or special needs for P&P will be respected if at all possible but ‘Signed-For’ posting is NOT an option anymore. I do not profit on posting, better quality packaging costs, I offer probably the best-value and safest shipping possible for ultimate confidence. The boxes and ultra thick double-wall stiffeners make a near impregnable fortress for safe shipping and this is used inland and overseas for ALL my records, not just the rare and expensive. I will invoice any winning bidder as soon as possible after the auction ends. My ‘loss’ or ‘damage rate’ is minuscule in over 14 years of Ebay trading and I consider that pretty exceptional. The only damage rate acceptable for this seller is ZERO and I think my packets will offer just that. It would take a vicious postman or postal service to damage these for sure. Oneadayrecords is a MAILER-FREE ZONE – they offer next-to-no-protection, and should be banned, no ‘professional’ should consider using them in my opinion. I discount of course for multiple purchases with a maximum of FIVE records per box (one double can sometimes be included subject to total weight). All postage costs are below and at the top of the listing. NOTE: First Time Bidders: Please ask me first. PLEASE NOTE: I now exercise my right to open a dispute after the Ebay rule of TWO days if no payment is received. I will then cancel the dispute to end the bid, again after the mandatory FOUR days and then offer the item to the runner-up or relist. The non-payer will also be blocked from my Ebay site as will any suspicious bids or bid withdrawals. Small businesses need prompt payment to trade and these strict rules WILL be applied. SHIPPING COSTS & CONDITIONS – THESE comply with EBAY’S RULES - PLEASE READ CAREFULLY: Posting & Packing: UK & CHANNEL ISLANDS all now sent via Recorded Delivery: 1 LP (FIRST-CLASS Recorded Delivery with Standard Royal Mail Insurance) [Signed For] = £4.75 1 LP (Special Delivery with Standard £500 Maximum Insurance) [Signed For, Next Day] = £7.50. (this includes insurance of £500). Add £1 per extra LP. Posting & Packing: EUROPE & SCANDINAVIA. (Airmail Only): 1 LP (Small Packet ‘Signed For’ with Standard Royal Mail Insurance [£50 maximum]) = £12.50 (enhanced Royal Mail insurance is an optional extra £3). Add £2 per extra LP. Posting & Packing: ALL OVERSEAS (non-European) e.g. USA (ANY PART OF); South America; New Zealand; Australia; Canada; Japan and other Far East; (Airmail Only: I NEVER use Surface Mail): 1 LP (Small Packet ‘Signed For’ with Standard Royal Mail Insurance [£50 maximum]) = £16.50 (£17.50 for double sets). Add £3 per extra LP. (enhanced Royal Mail insurance is an optional extra £3) Payment Conditions: I prefer PayPal or cheque from UK winning bidders. I can accept PayPal from overseas bidders or direct payment into my bank account. Potential Bidders: I will cancel any bids I feel are time-wasters. A maximum 3 days for communication and 7 days for payment to arrive - if not I will relist the item or offer to the runner-up. Fast deals get great feedback from me. Any questions - please ask and thanks for looking. My Guarantee: If any winning bidder is not satisfied with their purchase I will offer a complete refund. I will not refund if any defect detail is clearly stated on the advert and missed by the buyer, so read the item description carefully. If any overseas collector does not understand anything in my listing, please email and ask me to help. Thank You. SOME GENERAL GUIDES TO WEAR AND CONDITIONS TO HELP YOU DECIDE My Use of Description Terminology: Surface Marks = Superficial, usually light marks, hairlines or light scuffs that rarely sound. Scratch = a needle mark that goes below the record’s surface, some will sound, some will not, my play-grade will inform. Original = a record that has been pressed with the first label design which does NOT necessarily mean a very first pressed record. First Pressing = A record that I believe or know to be a genuine very first pressed record. I do not claim to always know for sure, and that’s why I state the stamper and matrix numbers if at all possible, for those who claim to know what they all mean, the information is there for the collector to decide. I prefer to use terms like ‘Early Copy’ rather than ‘First Pressing’ if I am not totally sure. Surface Sound = Mild, light sound, usually light crackle or similar. Distortion = Break up of the actual sound caused by groove wear or damage from a chipped stylus – the most undesirable form of unwanted sound, vintage mono records were the most prone to this happening but not exclusively so. The symptoms of distortion are high frequency clipping, moderate constant crackle or an echo type sound quality. Violin, piano and vocals are most prone to groove-wear distortion. Feathering = Fraying or softening of the entry edge of a cover. Covers with feathered entrance edges are more likely to have had the actual record inserted and removed more than a non-feathered, sharp-edged cover which are always far more attractive. Set Off, actually a printer’s term for dark ink leaving mild residue on pale or white ink when rested upon. e.g. when a gatefold cover has black ink closed against white, this can leave some black residue on the pale area – this is mostly unavoidable or course. The Argument for Vinyl Original sound and mix (mono mixes are rarely available on CD), high quality sound on clean copies (played on a hi-end dedicated analogue system – breathtaking sound! ), beautiful, large format covers, artwork, inserts and even full size posters etc; huge investment potential, and the pleasure of owning ‘the real thing’.